Over 100 years ago, a new swindle popped up in the world. Now known as the “Spanish Prisoner” Letter, this started with paper letters being mailed. 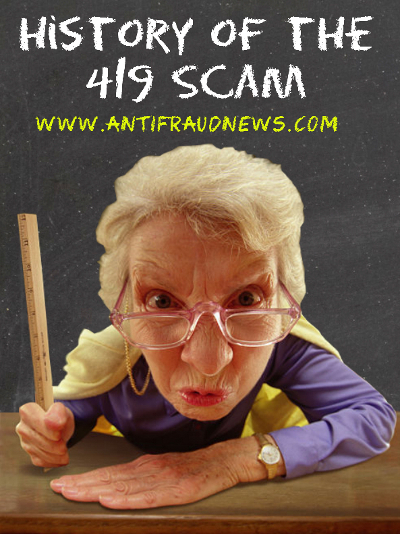 The scam was an advanced fee fraud type scam, where businessmen were contacted via a letter regarding a proposal. Someone connected to a wealthy family in Spain was in prison, and in exchange for a small fee to help smuggle them out, the wealth would be shared in exchange. The fee was paid… there was no Spanish Prisoner and no wealth to receive. Similar scams may date back to as early as the 18th or early 19th century in Europe. Fast-forward to the 1980s. For whatever reasons, during the extremely corrupt “Second Republic” in Nigeria under then President Shehu Shagari, variations of these letters started to appear from Nigeria. There were many different versions of the scam even at the beginning. Letters inquiring about the health of someone and apologizing for the long silence; what should we do with the profits from this huge investment of millions? Also the first instances of the Nigerian Prince or Royal Family member requesting help to transfer a large sum of money out of the country in exchange for a percentage. Then, along came the internet. With email vastly cutting costs of sending actual scam letters, a unprecedented amount of advanced fee fraud scams started showing up in emails. Though this was and still is a worldwide issue with internet fraud originating from all over the world, Nigeria earned a reputation as the chief offender for these scam emails due to the number that were associated with Nigeria. Advanced fee fraud is commonly referred to now as “419 Fraud”, 419 being the article of the Nigerian Criminal Code (part of Chapter 38: “Obtaining property by false pretences; Cheating”) dealing with fraud. Many of these email scams of ten years ago seem absolutely ridiculous. The wealthy Nigerian Prince or Princess that needs your help to get their fortune out of the country for example. However, the downright silly nature of some of these email scams could have been on purpose. Cormac Herley, a Microsoft researcher, observed: “By sending an email that repels all but the most gullible, the scammer gets the most promising marks to self-select.” The more far-fetched these stories were, the more confident the scammers would be that a person replying was a gullible enough candidate to fall for the scam. Nowdays, the Nigerian Prince scam is all but gone. Numerous types of more complicated internet fraud exist; via emails or otherwise. Scammers have learned to evolve and update their tactics. The fraudsters aren’t all from Nigeria, and they never were, but they’re still out there and still making a lot of money through fraud committed on the internet.